This simple salad is a delicious combination of nutritious ingredients, including fresh spinach, blackberries, tomatoes and walnuts. A sprinkling of feta cheese and a flavorful homemade dressing make it seem like you really fussed. Dovetailing tip: Remove the spinach you prepared when making Meal 1. It will be fresh and crisp for the salad. Pull out the reserved blackberries and rinse. 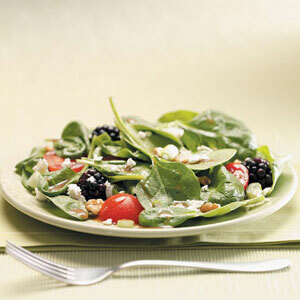 In a large salad bowl, combine the spinach, blackberries, tomatoes, onion and walnuts. In a small bowl, whisk the oil, vinegar, honey, garlic, mustard, salt and pepper. Drizzle over salad and toss to coat. Sprinkle with cheese. Serve immediately. Yield: 6 servings.